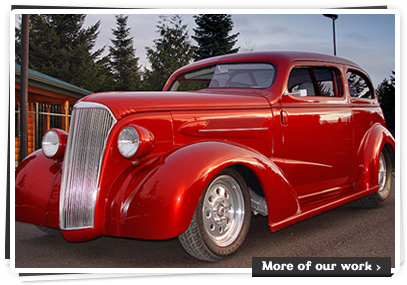 Precision Classics and Collision is a family owned and operated auto restoration business located in Eugene, Oregon. Auto restoration is not just a job to our family, it is a way of life. We refuse to sacrifice quality for quantity. We treat every job that enters our shop with importance, whether it's repairing damage from a minor fender bender or completing a full restoration; we will take the time to work with you every step of the way. When you choose to restore your vehicle, choose a restoration business that will care as much as you do. Precision Classics and Collision, where quality and trust come together. Check us out on Facebook or Myspace.